Retro football - or soccer, depending on where you're reading this review - slots are everywhere, and luckily, most of them are pretty good. I'm assuming slots developers are footie nuts at heart, as most of the football-themed slots online, such as Playtech's classic Top Trumps Football Legends slot or the more cartoony antics of CTXM's World Cup Soccer, really convey the passion, atmosphere and joy of the Beautiful Game. Slot developer Ash Gaming are certainly of the old-school if their video game-themed Sensible Soccer Euro Cup slot is anything to go by. It's packed with great atmosphere, lots of sport and some potentially big jackpots. Based on the classic console footie game of the early '90s (I remember wasting many an afternoon as a teenager kicking balls into the net for fun), the 5-reel, 25-payline slot features many of the characters and images from the game - they've even kept the 8-bit blocky graphics in for good measure. The lines are fixed in Sensible Soccer, so even playing at $0.01 a coin, you'll be paying out $0.25 at least per spin - it's something to remember if you want to keep things low. Saying that, there's so much going on you won't want to go elsewhere. Look out for one of three different Wild symbols, as they all help form winning combos and pay out big bucks. The Goalie, Fan and Ref symbols all substitute for other symbols other than the Euro Cup Trophy bonus icon and the Soccer Ball. 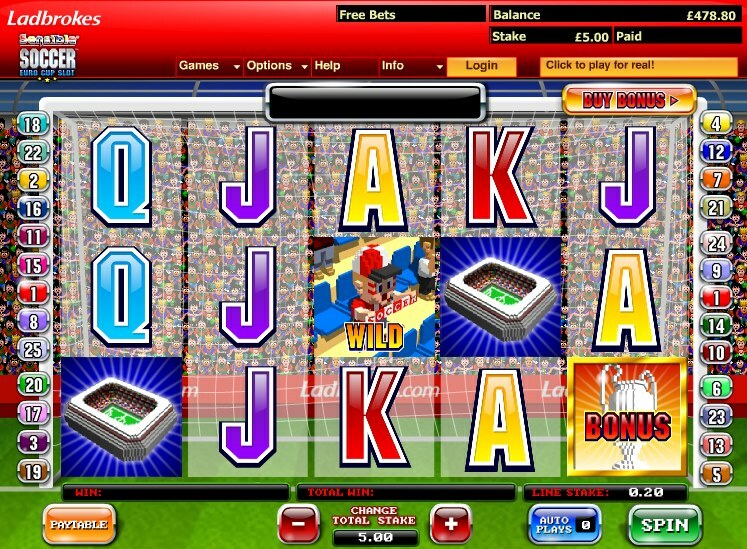 Three Free Spins Soccer Balls on Reels 1, 3 and 5 triggers a Free Spins round with a difference. You get a choice of different free spins - anything from 10 to 20 - but each choice carries an extra modifier. For 10 spins ('The Fanatic'), if the Fan turns up on Reel 3 he'll turn the symbols either side of him Wild. 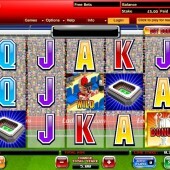 Choose the Ref symbol ('The Banker', awarding 15 free spins) and if he appears on Reel 2 he'll turn one or more reels Wild. Finally, pick the Goalie ('The Wobbler') and his top-whack of 20 free spins and if he appears on Reel 4 he'll turn random symbols Wild. The 'choice of three' free spins is a nice addition to any game, I find, and gives you a bit more choice than just smacking the Spin button for your regular 15 freebies. Look out for the Trophy icon, as three of those on Reels 1, 3 and 5 will trigger the Euro Cup bonus feature. Here's where the memories of that classic video game will come flooding back. Simply pick a team to follow through a tournament and win bonus cash depending on where your team finishes. Individual teams and final positions carry their own multipliers. But there's a progressive jackpot to be won as well. Follow the soccer matches being played during the bonus feature - if the match gets ten goals over two legs you'll bag the jackpot! If hitting three specific reels to trigger the bonus seems a bit tight, there's help at hand. With the 'Buy Bonus' option, players can automatically go to the Bonus game simply by paying out 30x your wager. It's a neat shortcut if you're keen on gunning for the big wins, and just another little touch that makes Sensible Soccer: Euro Cup a definite must-play for sports slots fans everywhere.